The Woman in White: Escape! Good news everyone! Laura’s not actually dead! Though what sort of quality of life she’s likely to have is still a big question. Apparently Percival and Fosco are getting so cocky they’re not even trying to hide what they’re doing. They discuss their nefarious plans to get rid of Laura right in the drawing room, where Marian can overhear them. Though she starts off listening on the stairs, she somehow, inexplicably decides she needs to continue this eavesdrop on the roof. In a rainstorm. Unsurprisingly, she comes down with a nasty fever. Fosco wastes no time alienating the doctor while making it seem like he’s doing it in Marian’s best interests (the doctor wants to bleed her, and Fosco’s like, ‘That sounds really medieval to me, and I’m Italian.’) It’s down to Laura, Creepy Countess, and the housekeeper to nurse Marian. Eventually, Fosco and Creepy Countess leave, after having sussed out Anne’s whereabouts from the unsuspecting housekeeper. 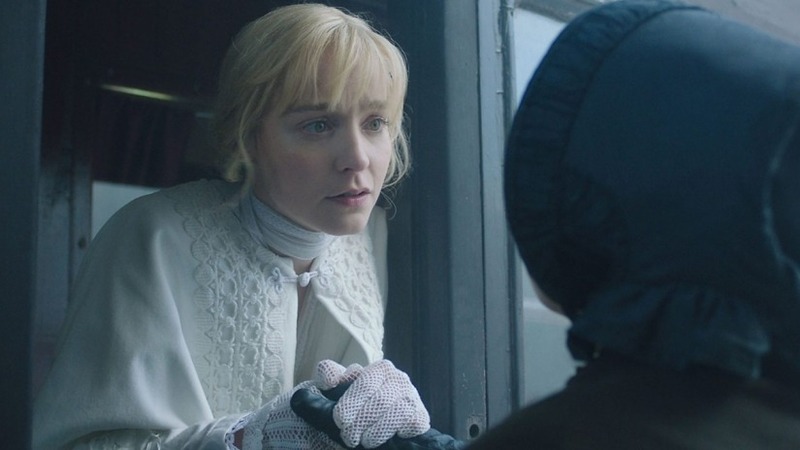 Before departing, Creepy Countess gives Laura some dope tea, and Laura wakes the following afternoon to the concerned housekeeper reporting that all the servants have been sent away, and Marian’s missing too. Laura demands to know where her sister is and her husband unconvincingly tells her that Marian went home to Laura’s uncle. She had a miraculous recovery, it would seem! Laura’s determined to go to her, and makes plans to travel through London. Percival suggests (well ‘suggests’) she stay with the Foscos while she’s there, but Laura’s sensible enough to know there’s something off about those two, so she refuses and says she’ll stay with her former governess instead. Then, before she leaves, she stupidly tells Percival she may never return. She reaches London without incident, but who’s there to meet her at the station but Fosco, of course. A part of me wondered why she went with him so meekly, when she could have gotten away. I mean, he couldn’t very well drag her out of the station without making a huge scene which is hardly what he wants. But then, you can’t really expect a sheltered young woman of Laura’s time and upbringing to feel confident enough in what is likely to be a strange city to defy a man supposedly sent to protect her. Fosco takes her home on the pretense that Marian’s there, but instead Laura’s met by two men who ask her some seemingly harmless questions (‘Where are you from? Have you ever lived anywhere else?’) before departing. Fosco reappears and hands Laura a drink, and because nobody in this show seems to have learned the vital lesson that you DO NOT DRINK ANYTHING THE FOSCOS HAND YOU, Laura drinks it and collapses. The next we see of her, she’s being packed into a coffin and buried beside her mother. And where has Marian been this whole time? Secretly locked up in an unused wing at Blackwater. She recovers from her fever wondering where the hell she is, and then the housekeeper happens upon her and is so creeped out by everything that’s happening she hands in her notice to Percival. Percival slyly reminds her that, if she leaves, there’ll be no one to take care of Marian at all, so she remains for the time being. When Laura dies, Marian receives word via letter and collapses, sobbing, into the housekeeper’s arms. Since she’s no longer really needed, Percival lets her go, although you’d think he’d be a bit worried about what she might say about him. She’s not like Laura; she doesn’t seem like the type to be afraid to bring in authorities. And, indeed, her first stop in London is at the lawyer’s office, where she speaks to a young associate of Gilmour’s who tells her that Walter’s back in town, and Laura died of natural causes. Marian finds Walter and tells him what happened. The two of them are convinced something crazy is afoot and are determined to get to the bottom of it. And now we pick up with all our flash-forward interviews, including one with a neighbour lady who basically raised Anne after her mother pretty much abandoned her. Mrs Catherick’s husband abandoned them too, after discovering his wife had been having an affair and that Anne was the result. It seems the neighbour claims Mrs C’s lover was Sir Percival, which seems odd. If that’s the case, then why does Anne have such a strong resemblance to Laura (something that’s remarked upon frequently and, indeed, the same actress plays both roles). But it could be the case: back at Blackwater, Percival is lying in bed, screaming and sobbing so loudly he brings that extremely loyal housekeeper running. The scrivener who’s been hired to conduct these interviews reports back to Walter and Marian that there does seem to be something odd here, but he can’t find anything else out. He suggests they start looking into Anne and her background. They begin visiting madhouses around London, bribing the people in charge until they finally find one where Anne is being housed. Marian goes to the visitors’ gallery, which overlooks the inmates’ dining hall and spots none other than Laura, straitjacketed and being spoon-fed her dinner. Laura, we have since learned, has been subjected to some absolutely shocking treatment while being trapped in this place, so it’s no wonder she’s deep in PTSD territory. Marian and Walter somehow scrape together enough money for more bribes to get Laura out of there. Heartbreakingly, she can’t manage to let Walter touch her; can’t so much as look him in the eye. He seems hurt but understanding. Marian takes her sister to Limmeridge, where, horribly, Laura’s douchebag of an uncle refuses to believe it’s her and summarily kicks them out of the house. May that awful man burn in hell. And the way Laura’s looking, it seems like even she isn’t sure she is who she is anymore. So, can Marian and Walter pull her back from the brink and get justice for her? We’ll just have to see.